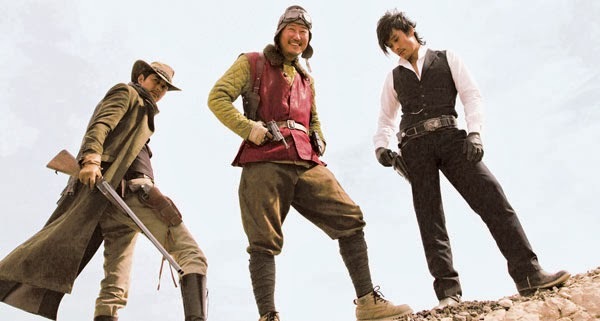 A Korean western starring not one but three of the country's biggest names, directed by one of the most celebrated Korean filmmakers of recent years. What's not to like? Ji-woon Kim has delivered quirky comedy drama (The Quiet Family), stunning horror (A Tale Of Two Sisters) and blistering gangster action (A Bittersweet Life) with massive success. Set in the 1930's Manchurian desert where lawlessness rules, fate intervenes when three Korean men meet each other on a train. Do-Won (Jung Woo-sung) is a bounty hunter who tracks down dangerous criminals. That would be the good then. Chang- yi (Lee Byung-hun) is the leader of a group of tough-as- nails bandits. That takes care of the bad. And Tae-goo (Song Kang-ho) is a train robber with nine lives. Anyone not keeping up at this point? The three strangers engage in a chase across Manchuria to take possession of a map Tae-goo discovered while robbing the train. Also on the hunt for the mysterious map are the Japanese army and Asian bandits. In this unpredictable, escalating battle for the map, who will stand as the winner in the end? Well, just so long as you’re not expecting a film that changes the world, I guess that would be the viewer. First things first, there’s pretty much no plot to speak of in Ji-woon Kim’s latest assault on the senses. Which amounts to little more than three guys looking for a map in a Wacky Races set-up that rarely stalls, reeling us in with electrifying chases, stylised gunplay and quirky comedy. The three lead performances are excellent, especially Song Kang-ho (The Host), who truly embraces the 'weird' of the title. He’s incredibly entertaining and takes centre stage for much of the movie. Lee Byung-hun is good value for money too, cutting quite the menacing figure in his black eyeliner and designer wear. Jung Woo-sung doesn’t have quite as much to do, but seeing as he epitomises the 'good' of the title, it’s understandable why he left less of a lasting impression. His performance is strong however, and the three stars fill the hole left behind by an absence of character development and plot. What the film does have in its favour is an abundance of cool action sequences, and a fair bit of money has been spent bringing The Good, The Bad, The Weird to life. This fast-paced romp sure looks stunning and the CGI was worth every penny. It’s over the top for sure, but I wouldn’t have wanted it any other way. Besides, the theatrical violence and elaborate gunfights certainly fit with the breezy tone of the movie.